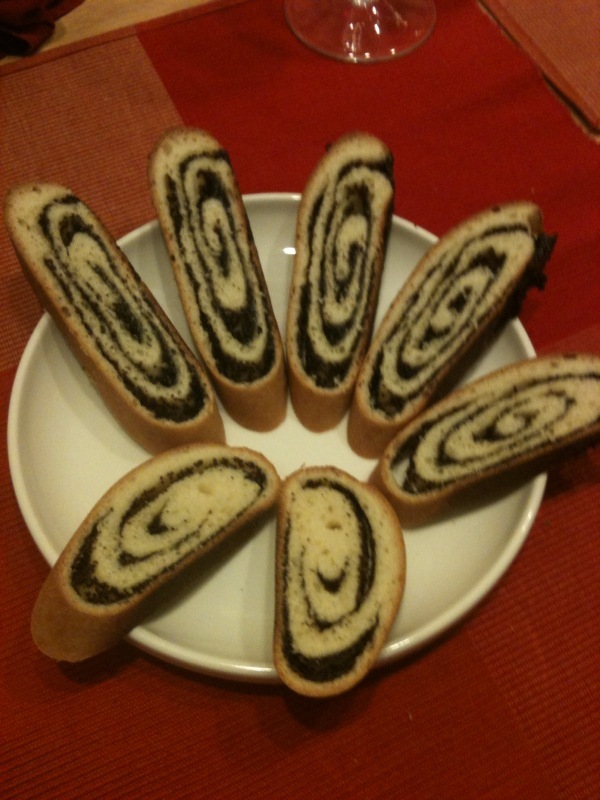 Makowiec is a special Polish baked good eaten during the holiday season, particularly on Wigilia (Christmas Eve). This recipe comes from a Polish cookbook, and was translated by my mom who immigrated to North America when she was 10 from Poland. Add water to the bread machine. In a separate bowl, whisk eggs, sour cream and vanilla extract. Add to water. Then add butter through salt. Lightly spoon flour on top of the water mixture. Make a little well in the flour, and add yeast. Select the dough setting on your bread machine. Divide dough in thirds. Roll each dough into a 9-12 inch square or rectangle on a large, floured surface. Spread poppyseed filling evenly over the dough, leaving about 1/4 inch space on 3 of the sides. Starting with the 4th side (where the poppyseed filling comes closest to the edge), gently roll the dough in a jelly-roll fashion (like you would a yoga mat or sleeping bag). Seal the edges (on both sides and on the top seam). Place on greased baking sheets. Cover and let it sit for about 30 minutes (or as my mom likes to say “until you get tired waiting”). Bake at 350 degrees F for about 30 to 45 minutes. Cool. Soften yeast in warm water in a bowl. Mix flour with sugar and salt. Cut in butter with a pastry cutter, until the mixture is crumbly. Beat eggs and egg yolks, mix with yeast, then stir in flour mixture. Add sour cream and vanilla extract. Mix well. Knead dough on floured surface for 5 minutes. Divide in half. Roll each dough into a 12 inch square or rectangle on a large, floured surface. Spread poppyseed filling evenly over the dough, leaving about 1/4 inch space on 3 of the sides. Cover. Let rise until doubled in bulk (about 1 1/2 hours – or as my mom likes to say “until you get tired waiting”). We love the Wigilia recipes!!! !